Taking part in national and international peacekeeping operations and missions is one of the National Army’s basic priorities. This shows our state strives for peace, stability and security both in the country and abroad as a basic means of strengthening peace. Beginning 1997, Republic of Moldova has actively contributed to OSCE-led international missions to Chechen Republic, Kosovo, Macedonia, Georgia; NATO-led operations to Bosnia and Herzegovina; UN-based missions to Liberia, Cote d’Ivoire, Sudan, South Sudan and Georgia, as well as post-conflict relief missions to Iraq. 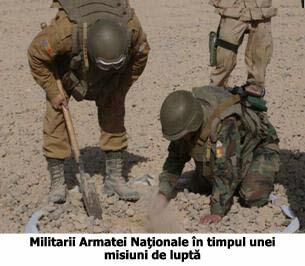 Republic of Moldova deployed a contingent of 41 servicemembers to KFOR mission from Kosovo consisting of 33 soldiers from the infantry unit, 7 EOD engineers and a staff officer, that carry out missions. as part of the Multinational Peacekeeping Force (KFOR). The Peacekeepers carry out missions in the multinational base “Camp Vilaggio Italia”, from Pech, Kosovo, within March 8 — September 8, 2014. The Commander of the National Army contingent in KFOR mission is LTC Roman Ceban. The decision to deploy a military contingent to Kosovo was approved by the Parliament of the Republic of Moldova, on November 1, 2013. The Peacekeeping mission in Kosovo is based on the UN Security Council Resolution 1244. The first OSCE mission the National Army contributed two officers to was in Chechen Republic during 1997-1999. 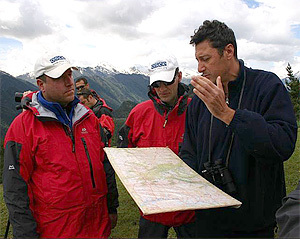 From October 1998 to March 1999, three officers took part in the Observation Mission to Kosovo. The National Army OSCE-led mission to Georgia held during 2000-2004 was the biggest one, with eight Moldovan officers engaged. From 2001 to 2002, two officers of the National Army worked for the OSCE mission to Macedonia, that was originally established to secure the independence of Former Yugoslav Republic of Macedonia. So far, 17 National Army officers took part in various OSCE missions (Chechen Republic — 2, Macedonia — 2, Georgia — 13) , demonstrating their professional skills and reiterating Republic of Moldova’s commitment to being considered both, as an international security beneficiary and contributor. The National Army UN-led missions to foreign countries began in April 2003. 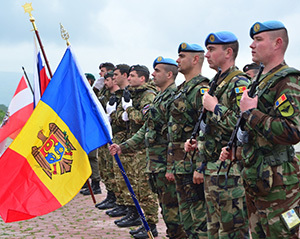 So far, 77 Moldovan servicemembers were engaged in UN-led missions to Cote d’Ivoire (32 officers), Liberia — 25, Sudan — 13, South Sudan- 4, Georgia — 2 and Kosovo — 1. Today, 10 servicemembers take part in UN-led international peacekeeping missions in Cote d’Ivoire (4 servicemembers), Liberia (2), South Sudan (3) and Kosovo — (1). 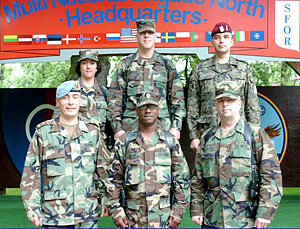 The National Army officers took part in the NATO-led Stabilization Force (SFOR) peacekeeping mission during December 2002 — March 2004. Two National Army servicemembers were engaged in each 6-month shift to supply Staff of the Multinational Division NORTH. The last shift was recorded in November 2004. A total of 11 National Army officers were engaged in SFOR Peacekeeping Mission (3 in Kosovo and 8 in Bosnia and Herzegovina). In compliance with Republic of Moldova Law “On Moldova’s engagement in international peacekeeping operations” No. 1156 — XIV as of July 26, 2000, Moldovan Parliament Decision No. 276-XV as of July 3, 2003 and the call of the United States and their allies, 43 servicemembers of the National Army were deployed in the humanitarian and post-conflict mission to Iraq during September 2003 — March 2004. Details about this mission. The hostilities in the Eastern armed conflict of the country finished through the “Agreement on principles of Transnistrian military conflict peaceful settlement” signed July 21, 1992, in Moscow. To implement the provisions of the Agreement, the Joint Control Commission (JCC) was established, consisting of three delegations (Republic of Moldova, Russian Federation and Tiraspol administration constitutional bodies), as well as the Ukrainian representative and OSCE Mission members to Republic of Moldova. Due to the above decisions, JCC established the Security Zone along the Dniester River, covering three sectors (North — Ribnita, center — Dubasari and South — Bender) with a 225 km length and 12-20 km width, where from servicemembers and militarized forces had to be removed. This goal was achieved by the Chisinau authorities, task failed by Tiraspol administration, that still keeps maintaining military forces in the Security Zone, including three of the four light brigades and other military units numbering nearly 3500 servicemembers. The Joint Peacekeeping Forces (JPF), consisting of the Russian Armed Forces, Republic of Moldova military and Tiraspol administration, were deployed to the Security Zone through JCC decisions. After the conclusion of Odessa Agreement on March 20, 1998, at the end of this year, Ukrainian military observers (10 servicemembers) started working in the Security Zone within the four-partite groups of observers. These groups are the basic task forces watching over the situation in the Security Zone under the direction of JCC and the Joint Military Command. There are currently 15 JPF checkpoints in the Security Zone.The three contingents of these forces consist of 1200-1300 servicemembers (without the battalion of the Transnistrian conflict outside the Security Zone directed by JCC as a reserve battalion). The JPF contingents are equipped with means of transport, infantry weapons, except the Russian contingent, that has also 16 armored technical equipment (TAB) 13 of which are installed at the JPF checkpoints (although the JCC Russian delegation pledged to remove them from the Security Zone by the end of 2003). The military units of the contingents are deployed in the following way: Russian military groups — in Bender (plus a subunit in Dubasari town); Republic of Moldova constitutional bodies — in Cocieri, Cosnita and Varnita; Tiraspol administration — in Dubasari and Grigoriopol. The military observers’ groups are deployed to Dubasari, Criuleni, Dorotcaia, Vadul-lui-Voda and Bender, and the Joint Military Command is deployed to Bender town. There are no JPF subdivisions deployed to the North part of the Security Zone. The JCC runs JPF through the Joint Military Command, consisting of commanders of the three contingents and commander of the Ukrainian observers’ group. The Joint Military Command fulfils its duties through the JPF Joint Staff. There is an increased security system in Bender town and Varnita, Gisca, Proteagailovca villages. The JPF command of this area is working in Bender. Another command of the North and central sector of the Security Zone is deployed to Dubasari. The Chief of the Joint Staff, the officers of military commands, leaders of observers’ groups and staff doing their service at the JPF checkpoints are mainly officers and non-commissioned officers of the Russian Federation contingent. All the decisions of JCC and the Joint Military Command are taken only through members’ consensus. Usually, the JCC organizes meetings Thursdays. In case of emergency, at the request of one of the delegations, emergency meetings are convened no later than 24 hours since the demand is filed. During the meetings, JCC examines and approves or adopts different decisions related to the Joint Military Command weekly report on the situation in the Security Zone, examines organizational problems (e.g. the assignment of JCC members, Joint Military Command and military observers) and other issues included in the daily agenda of the meeting or planned for further discussion. The emergency meetings focus on the examination and adoption of decisions on the settlement of different problems and incidents held in the Security Zone that require quick settlement. Usually, planned meetings take place in Bender Town, while the emergency meetings are held either in the place agreed by the delegations or in the above-mentioned town.